A Work Of Art is an SEO company with offices in Coral Springs serves businesses and entrepreneurs reach the top of search engine rankings for the most competitive key words and key phrases in their industries locally, regionally and nationally. Our longevity and success rate is testimony to our annual growth and 25 years in business in Coral Springs and Fort Lauderdale. 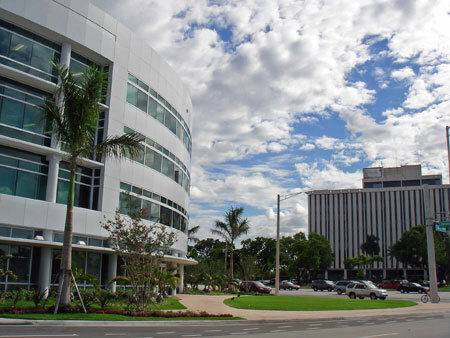 Clients such as NY Presbyterian Hospital, ATT, Gloria Estefan, and local start ups here in Coral Springs to Fortune 500 companies have become loyal fans of our stellar performance and unequalled customer service. We specialize in organic search because this is the core of any SEO (Search Engne Optimization) strategy. Organic search gets from 95% to 69% of all clicks according to our research and BrightEdge Traffic Research. Every company should focus on organic search for business growth. We also manage and build Pay-Per-Click campaigns as an add on to a more comprehensive SEO and marketing strategy. One case study of a client who specializes in tile restoration, installation and cleaning relied on paid search with a budget of $2,000 per month. We took over his SEO and marketing and within 12 weeks the company ranked #1 on page 1 of Google, Bing and Yahoo for every single key phrase and long tail key phrase in every city of the bi-county area of Palm Beach and Broward counties. Four weeks after that accomplishment his organic traffic represented 89% of click throughs. His conversion rate doubled and the company was able to all but eliminate his Ad Words campaign and save enormously on his marketing budget. Search Engine Optimization is a tedious, manual task that requires constant further education on a daily basis by experts who work diligently several hours a week on each website. We spend at a minimal for our basic plan of 40 hours a month up to over 200 hours a month perfuming multiple SEO tasks. Among them are viral marketing and organic 2nd party link building for a natural quality link profile, social media marketing, proper site structure for WC3 compliancy and Google specifications, SEM, and on-site and off-site SEO. Constant algorithmic changes constitute updating our strategies and assuring that the SEO we perform for our clients will last without the threat of demotions, or manual action penalties. Companies that do not have this expertise working for them often fall behind quickly and end up having to spend thousands of dollars on Ad Word PPC campaigns and recovery plans to recoup the traffic they once were accustom to. 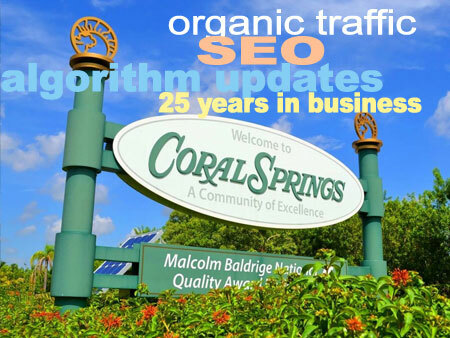 Our SEO marketing team at A Work Of Art in Coral Springs specializes in achieving page 1 #1 ranking our clients for all of the most competitive key phrases for your specific products and services in your demographic and industry. Our success rate for ranking at the top of page one for competitive key phrases is 94% for our entire Coral Springs client roster. We employ a wide array or products to attain quality links such as infographics, video and presentation submissions, guest blogging, viral marketing, and original meaningful and useful content. Subscribe to our article about "How To Hire An SEO Company." It is critical to hire an expert and pay for their knowledge because your business and livelihood depend on high ranking. Don't go cheap or fall for what sounds like "too good to be true" promises from an incapable company because that can cost your company enormous time and money to recover from penalties from Penguin or manual actions.